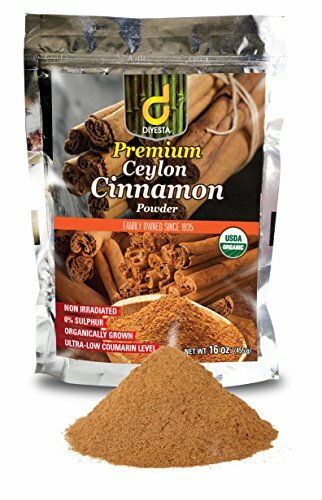 We have been making Ceylon cinnamon since 1935 and we are the only Ceylon cinnamon seller on Amazon who does the farming, cinnamon powder production, and selling on Amazon. Our Ceylon cinnamon is freshly ground in small batches and immediately sealed for freshness in re-sealable Aluminum foil bags. Our Ceylon cinnamon is a natural product; we do not use any additives or sulfur, because we understand the importance of sharing a healthy product. 1 pound bag locally grown in Southern Ceylon for the past 80 years. USDA Certified Organic and certified as "Pure Ceylon Cinnamon" by the Ceylon cinnamon association. 1,250 times less Coumarin than household cinnamon. If you have any questions about this product by Diyesta, contact us by completing and submitting the form below. If you are looking for a specif part number, please include it with your message.